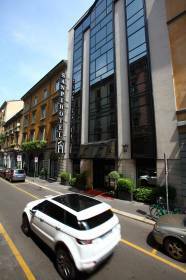 Welcome to Hotel Sanpi Milano, a charming 4-star-boutique hotel in the historic center of Milan, between Porta Venezia and Piazza della Repubblica, only 150 meters away from the underground MM1, Porta Venezia. The Sanpi Milano is a distinctively unique hotel, it is made up of an early 19th century completely renovated building, a new building with a mirror façade and something really special, an elegant 19th century Milanese villa overlooking an enchanting interior garden.In the magical atmosphere of our beautiful garden Our Guest can get away from the busy citylife routine. The meeting room “Sala Venezia” is day lighted by large windows and has direct access to the garden. Roofs are 5 metres high, giving breath to the spacious room (90mq). Particular attention is given to soundproofing and modern technology. Our staff will always be pleased and ready to satisfy every customer’ need or request including Coffee and coffee breaks. Our meeting room “Venezia” is ideal for small to medium business meetings, corporate special events and for those who want to combine efficiency and elegance.